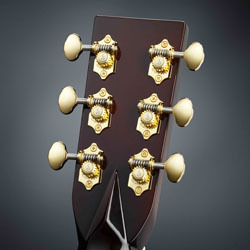 For over 60 years, Schaller has been making high quality guitar parts that are known for their precision, reliability, tuning stability and elegant design. The Schaller name stands for the highest quality, right down to the smallest detail. They are the original innovators who have shaped the development of guitar hardware. Schaller parts have the reputation for being the best you can get. As Schaller’s UK distributor, we supply the full range of Schaller guitar parts and accessories: machine heads, tremolos, strap locks, pick ups and transducers as well as spares. Made in Germany, with an established reputation for quality, style and innovation, Schaller’s products are suitable for both the amateur and professional. The famous Schaller "S" is both a seal of quality and a trademark, but also a promise - the promise to supply you with nothing but the highest quality. Each product goes through a complex quality inspection at the end of each stage in production.